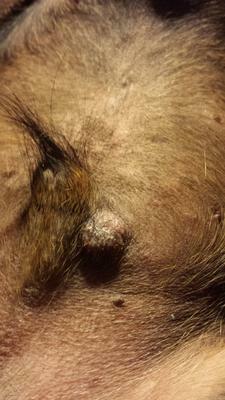 Reader Question: Treatment for a dog skin cyst or mass. About 2 - 3 days ago, I noticed this uneven growth near his little pipi (neutered). It is right under the skin and moves, doesn't leak and doesn't hurt. I put some hydroggen peroxide 3% on it. My dog acts normal and doesn't seem to have any discomfort. He is 6 years old. Keep an eye on the new mass that you found in your dog’s skin. If it grows or changes significantly or if it starts bothering your dog, make an appointment with your veterinarian immediately. But if it remains stable, you should be fine waiting to have it examined at your dog’s next regularly scheduled check-up. Depending what it looks and feels like at that time, your veterinarian may want to aspirate some cells/fluid with a needle and syringe and then examine the sample under the microscope. Sometimes this simple and inexpensive test can tell you if this mass is anything to worry about. I have been dabbing 3% hydrogenperoxide on the cyst - or whatever it was - every night. It kept getting flatter and smaller and is now just about gone. I also squeezed some pus and blood out. My little boy didn't seem to be uncomfortable throughout these procedures and seemed to know that I wanted to make it better. Join in and write your own page! It's easy to do. How? Simply click here to return to Skin Tumors.